Testing is the dominant technique for quality assurance of software systems. It typically consumes considerable resources in development projects, and is often performed in an ad hoc manner. 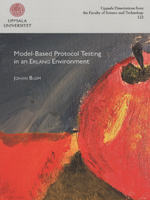 This thesis is concerned with model-based testing, which is an approach to make testing more systematic and more automated. The general idea in model-based testing is to start from a formal model, which captures the intended behavior of the software system to be tested. On the basis of this model, test cases can be generated in a systematic way. Since the model is formal, the generation of test suites can be automated and with adequate tool support one can automatically quantify to which degree they exercise the tested software. Despite the significant improvements on model-based testing in the last 20 years, acceptance by industry has so far been limited. A number of commercially available tools exist, but still most testing in industry relies on manually constructed test cases. - a technique for automatically generating test suites. Based on these developments, we have implemented a complete tool chain that generates and executes complete test suites, given a model in our specification language. The thesis also presents a substantial industrial case study, where our technical contributions and the implemented tool chain are evaluated. Findings from the case study include that test suites generated using (model) coverage criteria have at least as good fault-detection capability as equally large random test suites, and that model-based testing could discover faults in previously well-tested software where previous testing had employed a relaxed validation of requirements.